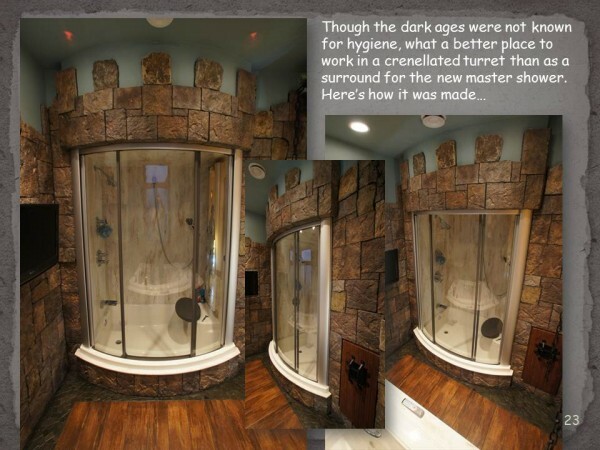 Our Medieval Bath is an award winner! This is a very unique project and a pleasure to be a part of! 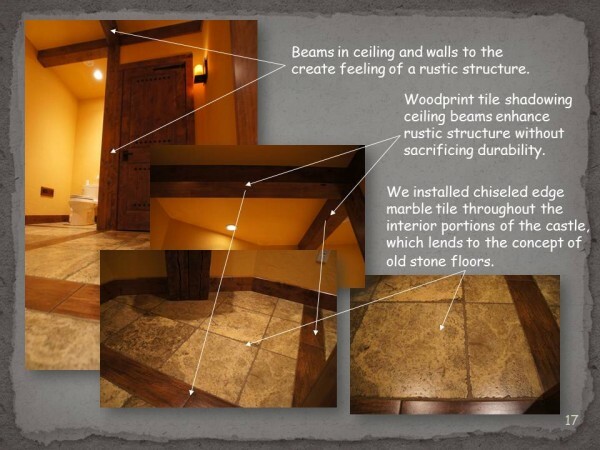 It required innovation and creativity at every point throughout the project. 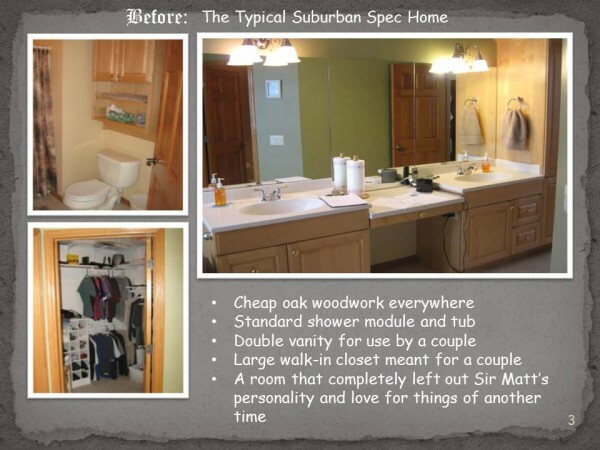 To read further about the project, check out our previous post A Medieval Master Bath Remodel in Waunakee, WI. 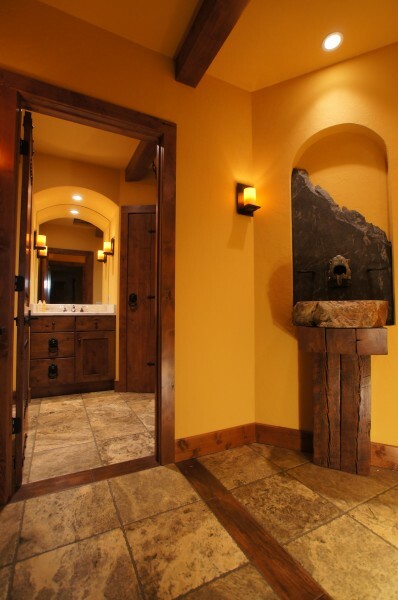 To see more project photos, visit our Award Winning Designs page. 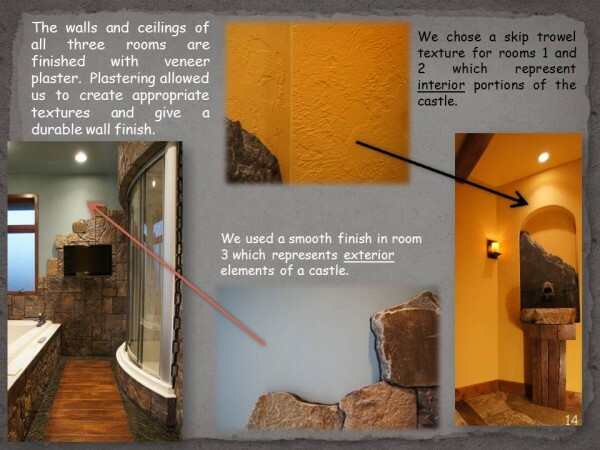 A Medieval Master Bath Remodel in Waunakee, WI! 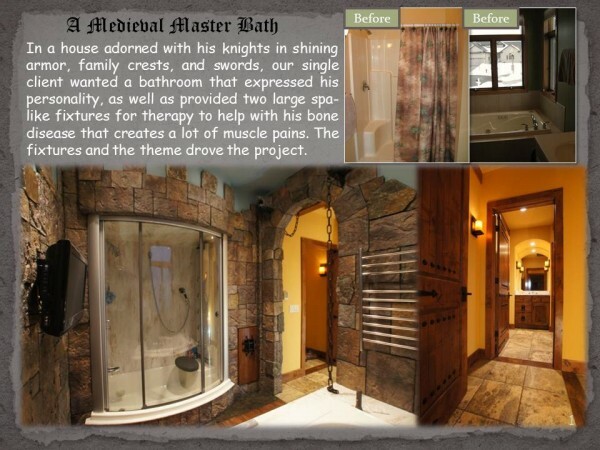 Our latest project was a Medieval master bath remodel in Waunakee, WI. 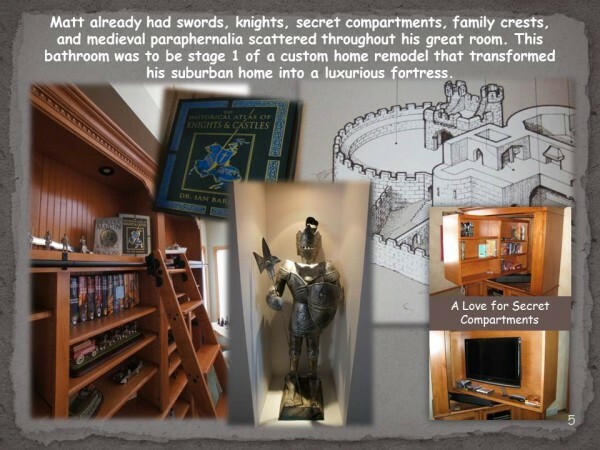 When you walk into our client Doc’s house, you see Medieval knights in shining armor, books on castles and fantasy tales of times of castles, knights, kings, and queens. He has an entire collection of his family’s crests on the walls. 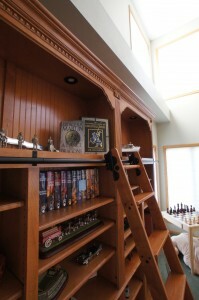 He even has a book case with a rolling ladder! 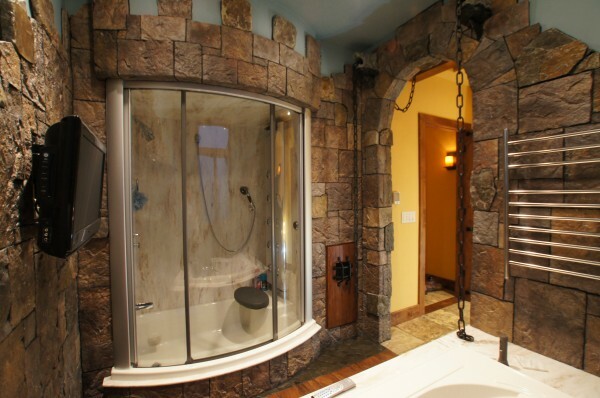 Seeing all of these unique possessions, we couldn’t help but consider making his new bathroom into a Medieval castle! Now, you may be picturing something very gaudy, but we don’t do gaudy. 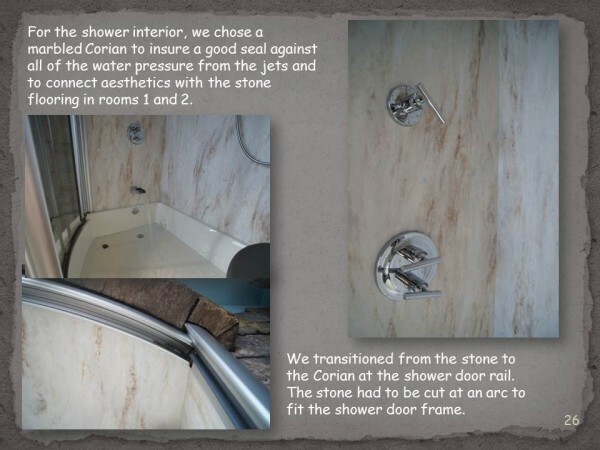 With our top notch craftsmanship and a many creative solutions, we managed to create a bathroom suite that eludes a feeling of luxury and mystery… the way that castles should! Doc has a bone disease that causes muscle pain. 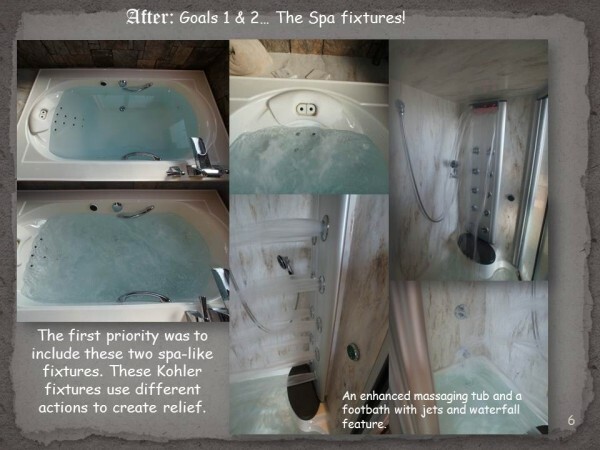 He wanted to reconfigure his master suite to allow for two therapeutic, spa-type fixtures from Kohler to help him relax his muscles. 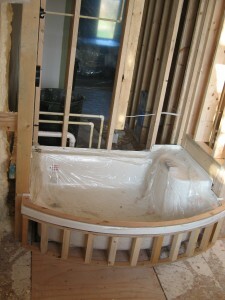 The Kohler shower came in a curved fixture that required more space. 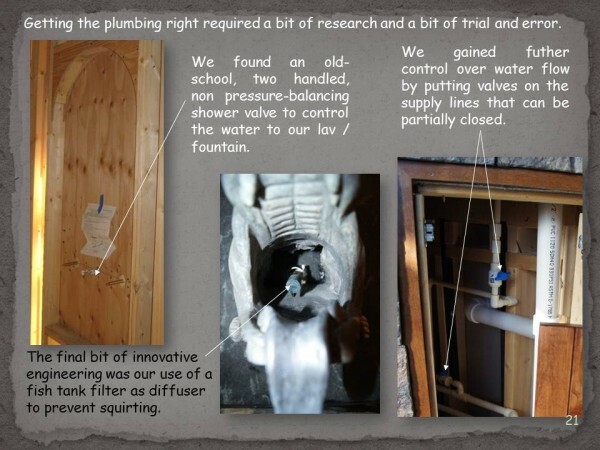 The whirlpool would be fitted in a similar position that the previous whirlpool was located, with a few adjustments to the plumbing. 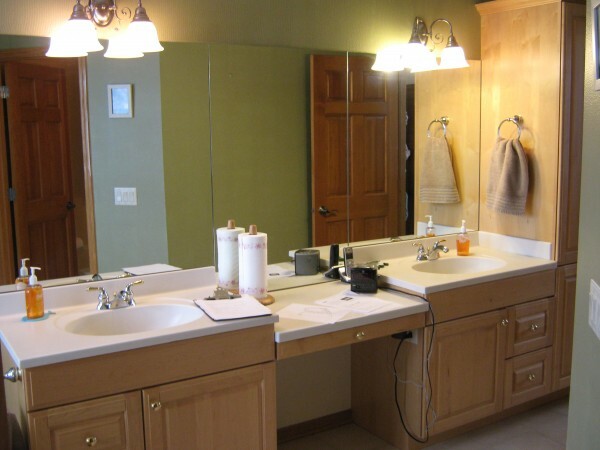 As a single man in his recently purchased home, Doc realized that the bathroom didn’t suit his needs fixture wise on several counts. 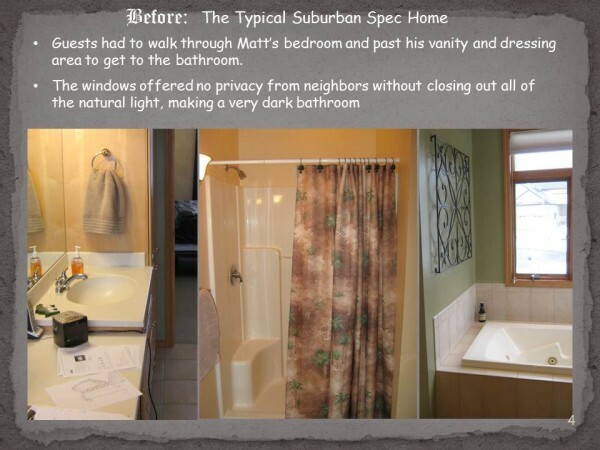 He needed spa fixtures for muscle relaxation, but didn’t need a double sink or over sized walk-in-closet that was meant for a couple. 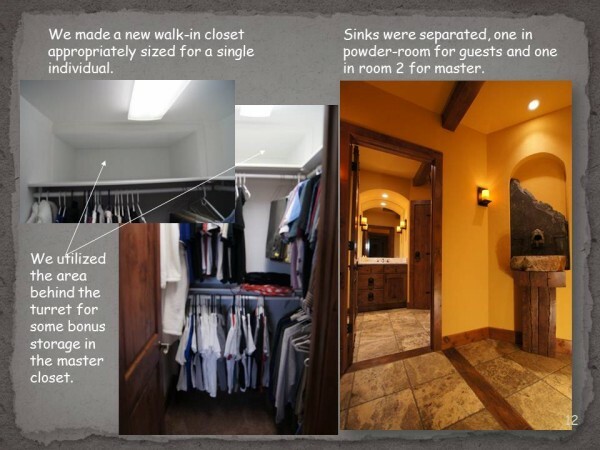 The ability to take over the closet allowed us to reconfigure the entire floor plan into three separate rooms. 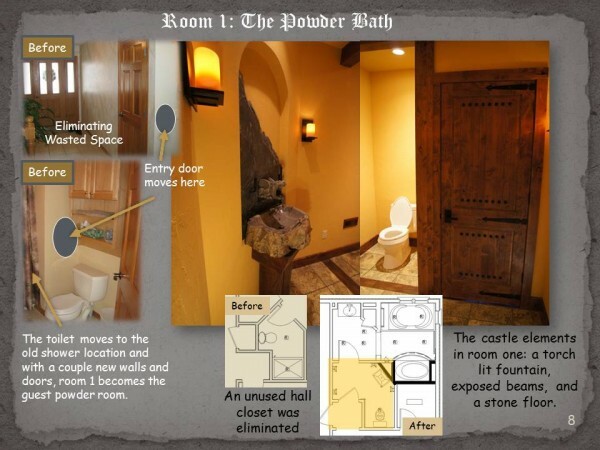 The first room is a powder room that can be closed off when guests need to use it. 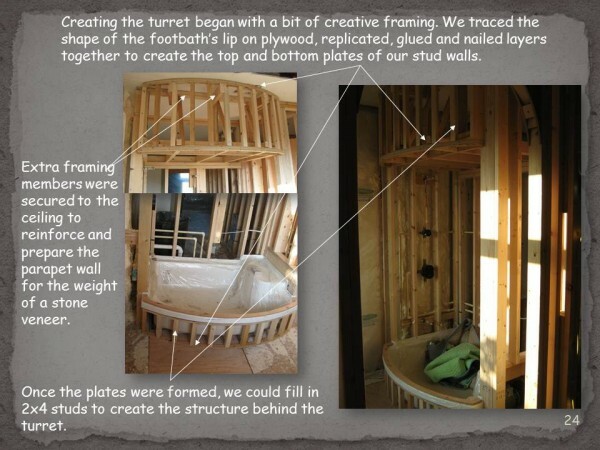 As a man who values his privacy, being able to close off his personal vanity and bath was a great improvement for his first floor bathroom suite. 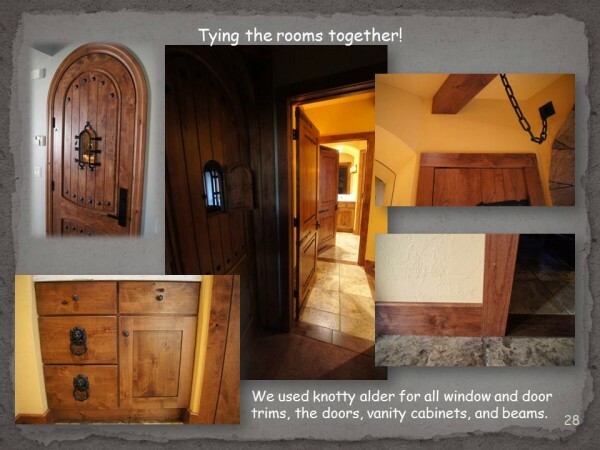 You enter the master suite through a large exterior door with a speakeasy… preparing visitors for what is to come. 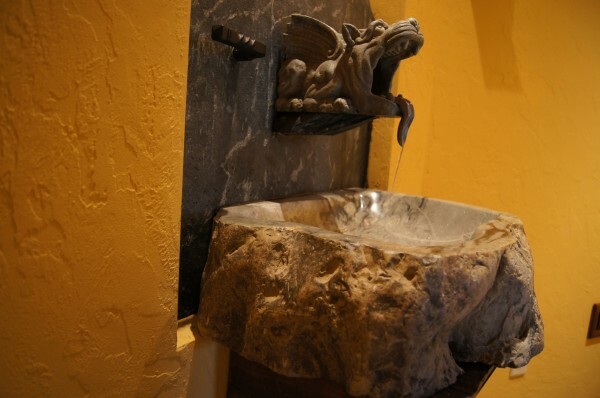 When you enter the powder bath, the first thing you see is the gargoyle fountain. 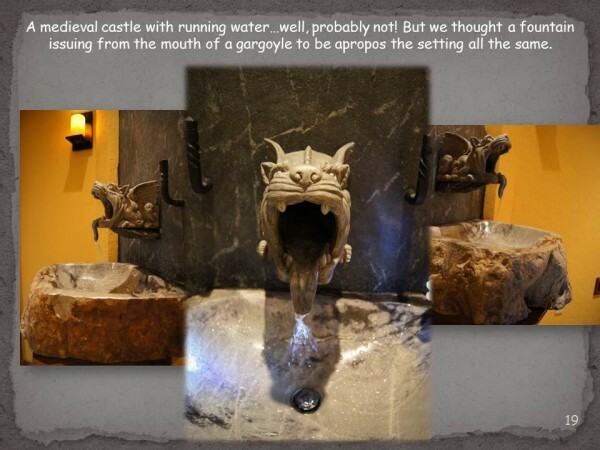 Doc found an eaves spout tray in the shape of a gargoyle and we did some creative plumbing work to make it into a fountain with controlled water pressure to prevent splashes out of the gargoyle’s mouth. 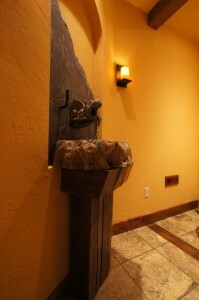 The sink is a stone sink that Doc just fell in love with. 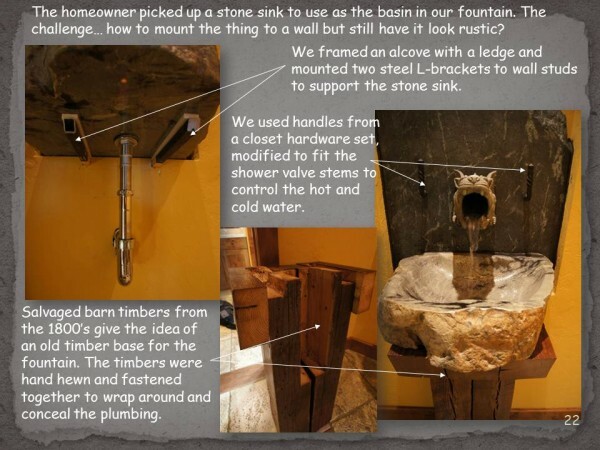 The problem was, what do you put an odd-shaped, rustic stone sink on? 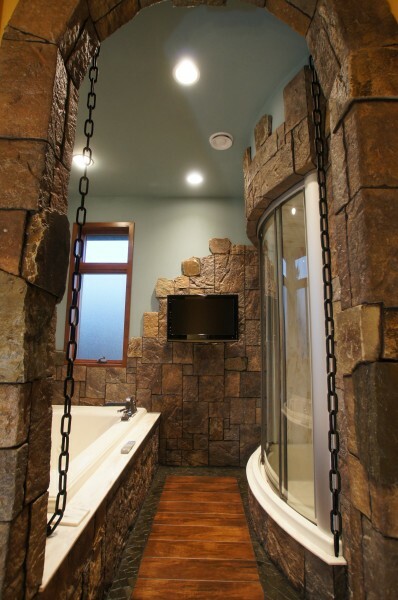 Everything would look too clean cut and it wouldn’t match with his castle decor. 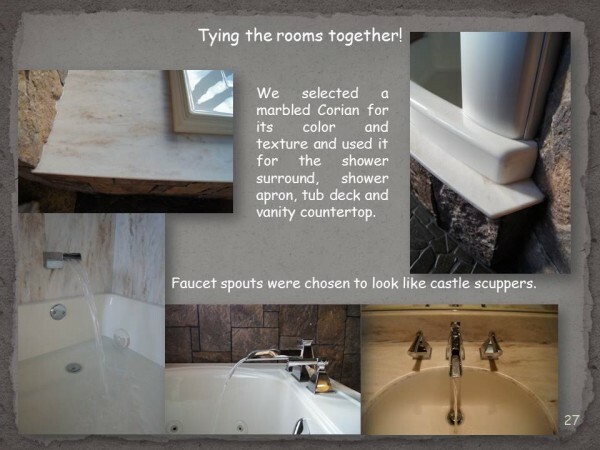 We purchased some salvaged barn beams from the 1800’s, then stained, cut, and fit them around the plumbing. 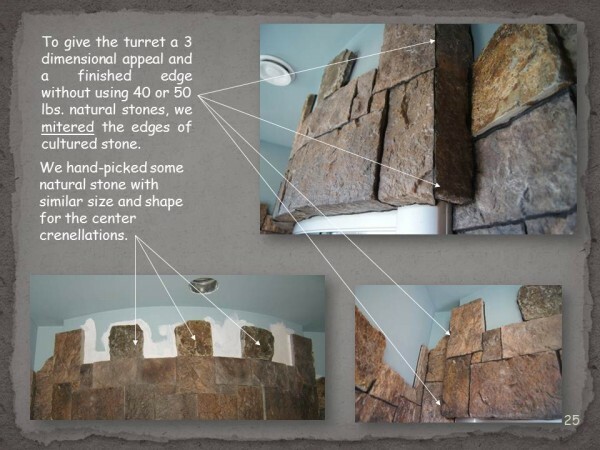 This gives the illusion that it’s supporting the heavy stone sink. 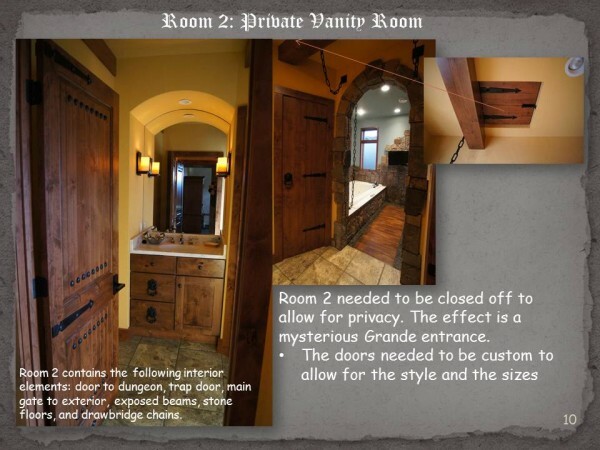 The second room you enter is a vanity room. 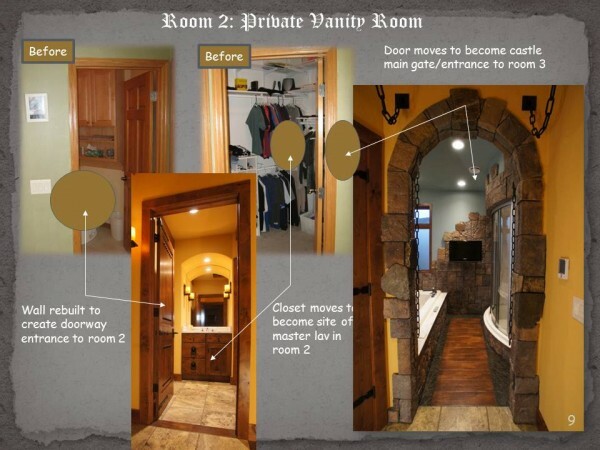 It’s complete with a trap door (access panel into ceiling), dungeon door (to linen closet), wood beams, marble-looking Corian, and stone floors as well as candlelight sconces and candle glow yellow walls. 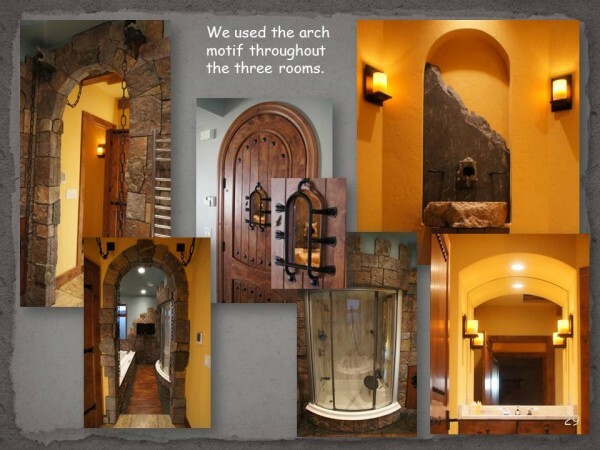 The archway to the right of the vanity introduces you to room #3. 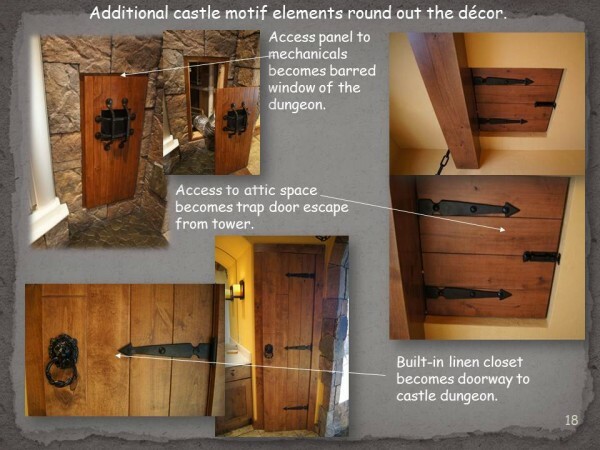 This room is themed as the exterior of the castle. 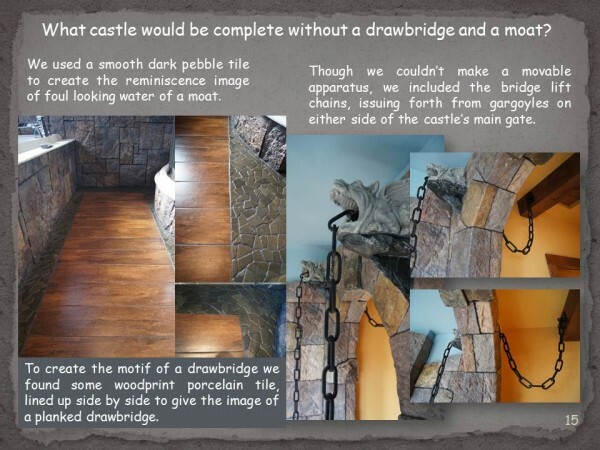 The plastered walls are painted a sky blue and the walls of this conceptual castle are covered in rock –a nice mix of manufactured and natural stone to give it texture. 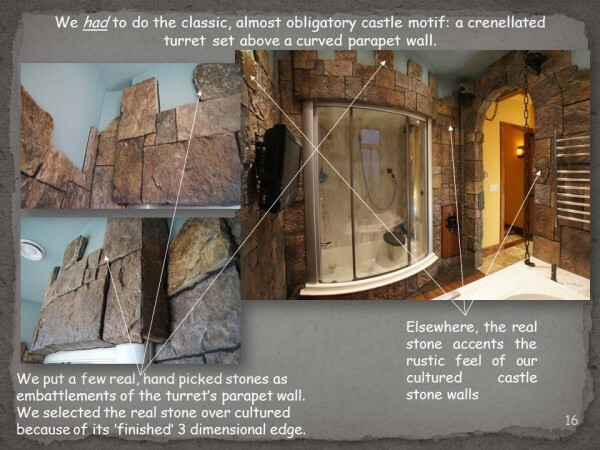 In addition, the rock forms crenelations around the turret formed around the curved bath fixture. 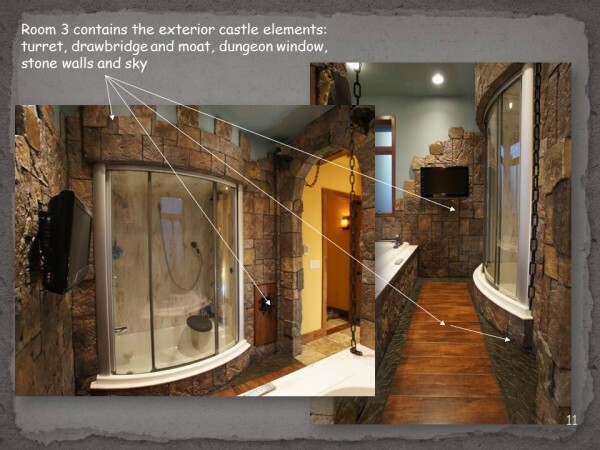 To the right of the shower is another door, called the dungeon window. 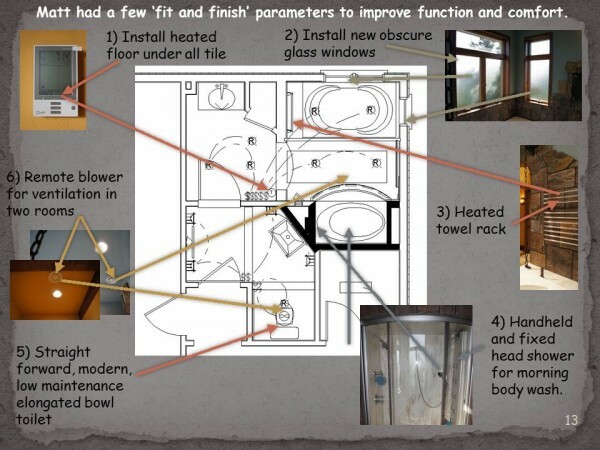 It’s a heat vent as well as an access panel to the shower fixture. 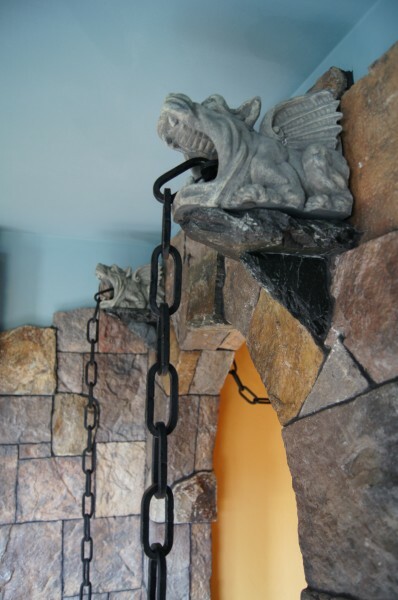 The flooring is transitioned into a conceptual drawbridge with chains dangling out of gargoyles at the top of the archway. 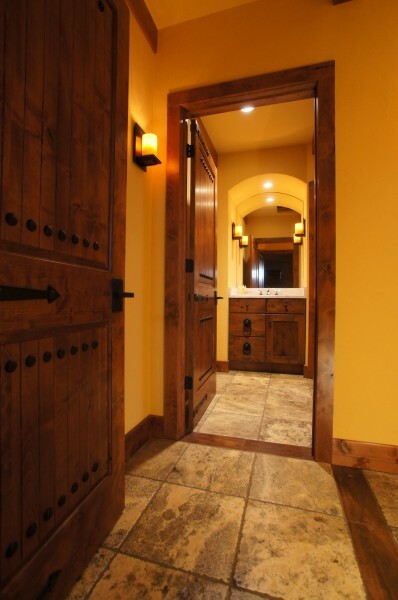 The drawbridge is made of a wood-looking tile that matches the other wood tile found in the other rooms. 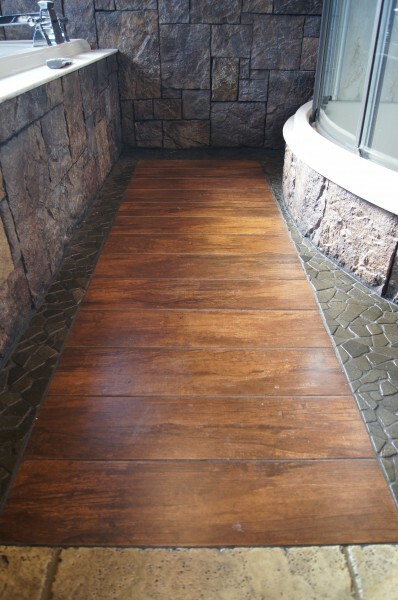 In addition, the water around the bridge is achieved through the use of muddy water-colored rock tile. Who wouldn’t want to watch the game in there?! 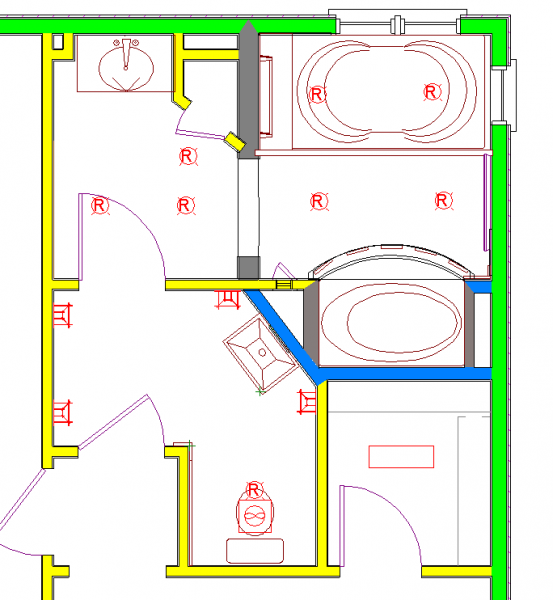 The room is equipped with several other luxuries as well. 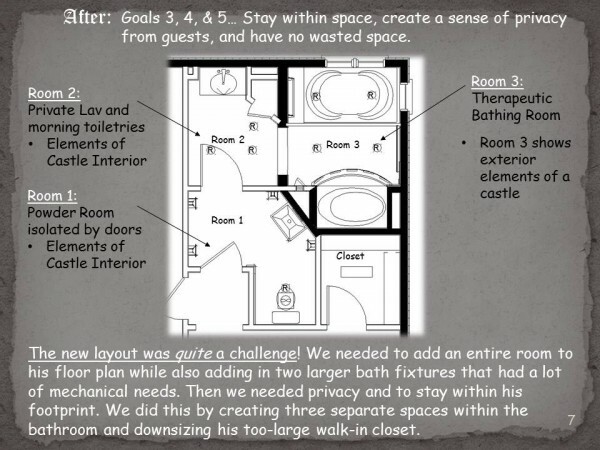 It has heated floor tile, a heated towel rack, and a few remote blowers for better ventilation. As for the closet, we put a new walk-in closet that is suited for Doc’s needs. The linen closet (dungeon door) includes hangers for Doc’s work clothes so he can get ready in the morning more efficiently. Finally, this job proved to be complex on many levels. 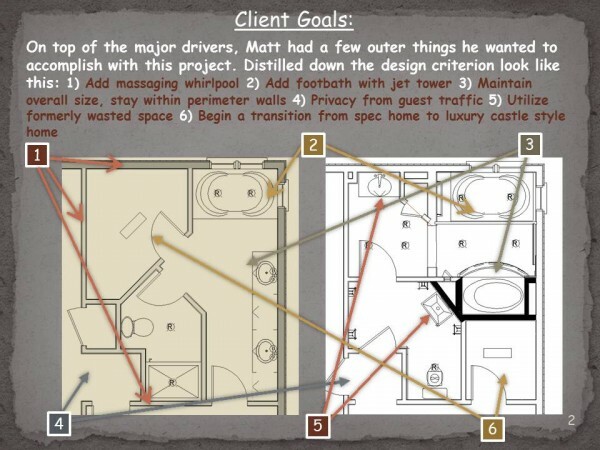 It required innovation to overcome technical challenges, as well as creativity to resolve aesthetic and design criterion, and a bit of “what the heck, let’s try it!” This project also shows that we can take even the most conceptual design ideas and turn them into a luxurious reality. 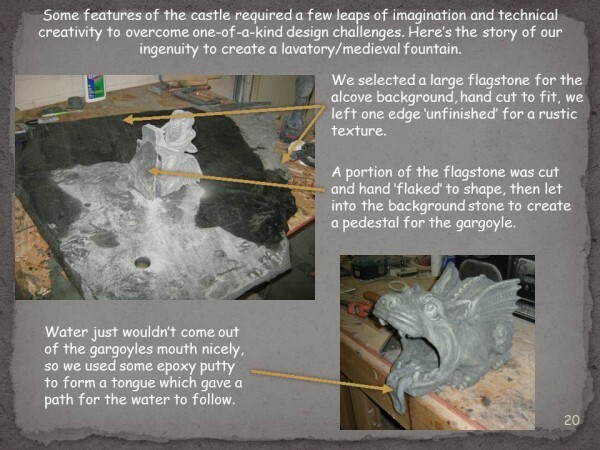 It’s a rare project that we feel privileged to have had the honor of working on. Thanks for the honor, Doc! 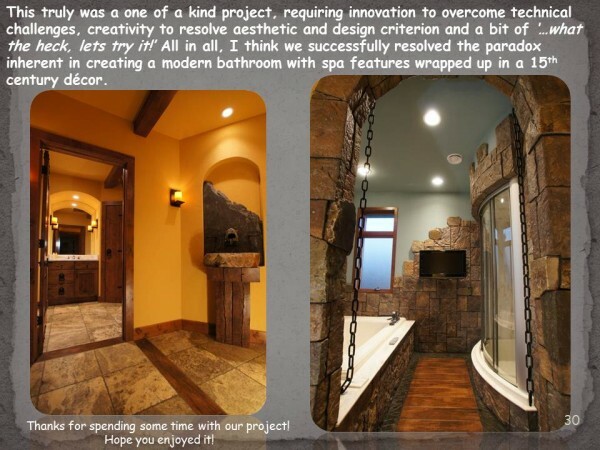 To see more project photos, visit our Award Winning Bathrooms page.